THIS HISTORIC BIKE IS NOW BACK AT HOME WITH LARS (SAN DIEGO, CA) WHERE IT RIGHTFULLY BELONGS. THANK YOU LARS FOR THE ARTICLE PROVIDED....MORE TO COME ON THIS BIKE. Lars Larsson was a pioneering motocross and off-road racer from Sweden who helped introduce motocross racing to America in the late 1960s. He was a leading International Six Day Trials/Enduro (ISDT/ISDE) rider during the 1960s and 1970s. He earned multiple gold medals riding for the United States, Mexico and his native Sweden. In addition to his excellent racing record, Larsson was also instrumental in setting up the original Husqvarna dealership network across America in the late 1960s, which helped further off-road racing in this country. He also helped launch Torsten Hallman Original Racewear (THOR), which became a leading motocross racing gear and apparel company. Larsson was born in on July 5, 1941 in Stockholm, Sweden. As a boy, he was fortunate to be able to hang around the shops of many of Sweden’s top racers. He especially admired his country’s world motocross champions from the 1950s, such as Sven Lundin and Bill Nilsson. After finishing school, Larsson took a job as a mechanic for Ford and a fellow worker, who was a motorcycle racer, helped get Larsson started in racing. His first race was in 1959 in a Swedish enduro. Larsson rode a Husqvarna 175. 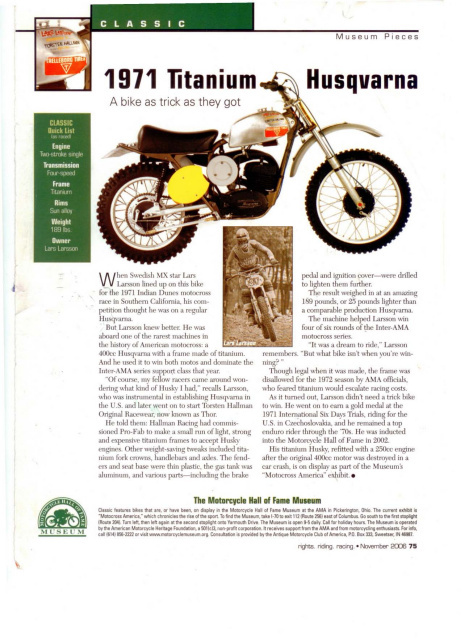 "The Husqvarna 175s were street bikes," Larsson recalled. "But we would convert them to off-road bikes by stripping them down and making them as light as possible. Even the Husky factory riders rode the same basic machine. It was a little more special of course, but it was still a 175." Larsson advanced through the junior and senior ranks and by 1964 he was a full-time professional racer. He raced the Swedish championships as well as other races across Europe. "We would train all winter," Larsson said. "We would jog in deep snow, cross-country ski, do gymnastics and then of course we would put studs on the tires and continue to practice on our motorcycles. And we would take off for Europe in early spring to start racing. I remember traveling all over Europe alone with my motorcycle in the trunk of an old Mercedes and sleeping on an air mattress. We made enough money to get by, but that was about it." In Sweden, motocross had team leagues as well as individual competition, and Larsson was part of a Swedish national championship-winning squad. He was just beginning to participate in world championship motocross events when an exciting opportunity was presented to him. Edison Dye was looking for a Swedish rider who had enough business experience to help set up dealerships in America. Representatives of Husqvarna recommended Larsson and in the fall of 1967 he arrived in America for what was to have been a year-long business trip. Three days after landing on U.S. soil, he participated in his first race, the Indiana State TT Championships. As Dye and Larsson uncrated a Husqvarna motocross racing bike, it attracted a large crowd of curious fellow riders and spectators. "They were looking at the bike and scratching their heads," Larsson smiles as he remembers. "They had never seen a Husky and told me that I would never be able to get traction with the knobby tires. They were all riding Bultacos and such with low pipes and flat-track tires. Of course I was a professional rider racing against amateurs and I won the race." It was the start of an incredible journey for Larsson in America that, instead of lasting for just one year, never ended. Shortly after his American racing debut, Larsson, who barely spoke English at the time, found himself traveling the country alone in a van with a couple of motorcycles in the back, going from motorcycle dealership to dealership across the country trying to set up a sales network for Husqvarna. "My job training consisted of Edison Dye pulling up to phone both and instructing me to rip out the motorcycle section of the yellow pages and start my calls. That was it! I was on my own after that. At first I didn’t understand the interstate system in America and how easily you could get around. So I drove on city streets from one dealership to another. My first stop was in Toledo, Ohio, and I went back and forth across the entire town on city streets about three or four times to the dealerships in town. I thought it would never end." But Larsson and the new-fangled Husky made quite an impression on many dealers. His stop at one dealership was particularly memorable. "I remember I stopped at Competition Cycles in Xenia, Ohio," said Larsson. "They told me to go out and show them the bike by riding in this field across from the dealership. Well I got out the bike and it fired on the first kick, which not many bikes did in those days, and then I ripped across this field doing wheelies. When I came back in they stood there with their eyes wide open and told me get them a shipment of bikes as quickly as possible." During the week Larsson would travel the country recruiting dealerships and on the weekends he would race. He raced in all types of events, from TTs to scrambles and enduros. It didn’t matter what it was, if there was a race in the area Larsson was there showing off the Husqvarnas, and winning most of the time. He was one of the riders Dye featured in scrambles races during the fall of 1967 and ’68 as European-style motocross was being introduced to America. "For the European riders it was a vacation after the rigors of the world championship," Larsson recalls. "It didn’t take long for the Americans to catch on and it became a lot more competitive by the early-1970s." Larsson was a leading rider when the AMA instituted the Inter-AM motocross series. In 1971, Larsson won four of the five Inter-AM 500cc non-national races on a special Husqvarna racer built with a titanium frame. His true forte became off-road racing. He was a leading national enduro rider through the 1970s and earned gold at the 1971 International Six Days Trials (later called the International Six Day Enduro) in Czechoslovakia riding for the U.S.A. Trophy squad. Larsson calls his victory at the classic Berkshire Enduro in the early 1970s as one of his most memorable. "Berkshire reminded me in many ways of Sweden," Larsson said. "I fell in love with that place. It was such a great environment for an enduro and was so well organized. In my heart Berkshire was the best of all enduro races in America." By the late 1970s, Larsson retired from racing professionally. During his career he was a factory rider for Husqvarna, Can-Am, Maico and Kawasaki. He continued to race on the amateur level and earned a World Vets Motocross Championship in 2001 at the age of 60. 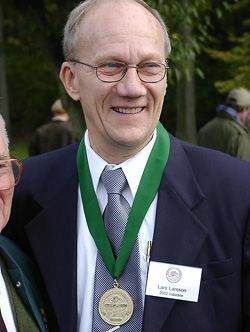 When inducted into the Hall of Fame in 2002, Larsson lived in San Diego running his business, which now exports American motocross products to Europe. Larsson says a day doesn’t go by without admiring what American riders have been able to accomplish in motocross. "A little part of me feels proud that I was at least a small part of that."